This chic nosegay is wrapped in matching ribbon. Most gardeners know as fragrant Dutch hybrids (H. orientalis), which grow a foot tall and bear fat spikes of tightly packed, waxy blooms in blue, yellow, salmon, white, red, or purple. These bulbs are typically massed in beds or pots. 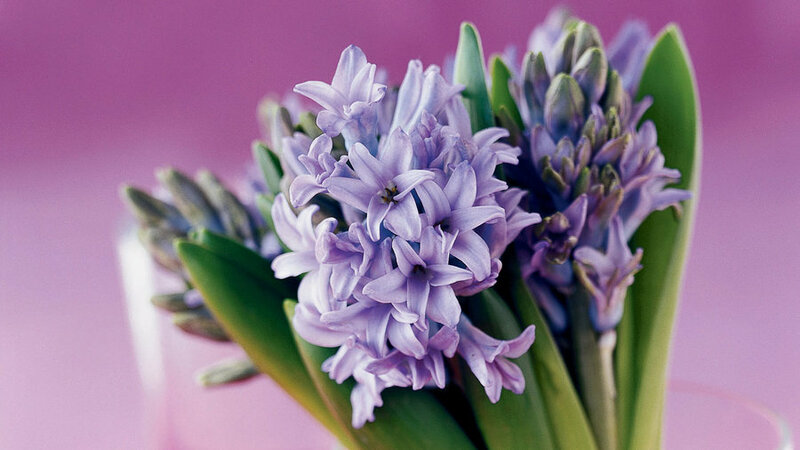 But Roman hyacinths (H.o.albulus; also known as French hyacinths), native to the south of France, are smaller than Dutch hybrids. Each bulb produces several slender, foottall stems, each with loose spikes of white, pale blue, or pink flowers. They’re good for naturalizing and thrive in areas with little or no winter chill. Planting time: September where winters drop below 20°F; October to mid-November in warmer regions. Bloom time: March and April. Start them from: Bulbs (at least a dozen per bouquet). Where to buy: At garden centers and nurseries, or from mail-order suppliers and . Soil: Organically enriched, sandy, and welldraining. Planting: In garden beds, set large bulbs 4 to 5 inches deep and 5 inches apart; smaller bulbs 3 inches deep and 4 to 5 inches apart. In containers, plant in porous mix with bulb tip near the surface. Cover the potting mix with thick mulch of sawdust or peat moss to keep bulbs cool. When top growth shows, remove mulch and place in full light. Water: Irrigate regularly during the growth and bloom season.